Mickey’s 90th Anniversary. The New York Bank Hoard. Coins That Never Were. 2019 Graded Silver Panda. Royal Mint New Releases. 2018-Mo Mexico 1/20 oz Gold Libertad. 05 Coin NGC MS69 FR Exclusive Lbl SKU54889. The Gold Libertad bullion series was introduced in 1981, though annual release of the series did not begin until the year 2000. Following a ten year hiatus in production, the Mint of Mexico (La Casa de Moneda de Mexico) expanded the series in 1991 to include a 1/10 and 1/20 weight. Representing the smallest weight of the series, this 2018 dated Libertad is struck from 1/20 oz. Imagery Representing National Pride and Independence. A gloriously detailed representation of Mexico City’s statue of “Winged Victory” standing on the Mexican Independence Victory Column adorns the reverse. Inscriptions include 1/20 ONZA ORO PURO 2018 LEY. 999″ and the Mexican Mint’s mark “MO. The obverse features the Mexican Coat of Arms: a Golden Eagle wrestling with a rattlesnake while standing on a prickly pear cactus. Inscribed “ESTADOS UNIDOS MEXICANOS” (United Mexican States). Exceptional Mint State 69 First Releases with Exclusive Mexico Themed Label. This 2018-Mo Mexico 1/20 oz. 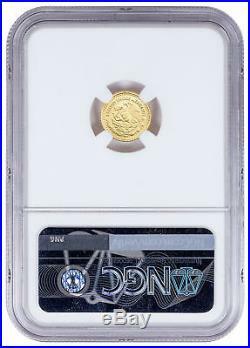 Gold Libertad Coin is graded a virtually flawless Mint State 69 by Numismatic Guaranty Corporation (NGC). The coin is additionally designated among First Releases, indicating that the coin was submitted to NGC for authentication and review within the first thirty days of release. The sensational bullion coin is protected in a NGC holder affixed with a certification label style available only from ModernCoinMart depicting iconic Mexican imagery. This 2018-Mo 1/20 oz. Gold bullion release of Mexico’s classic Libertad coin will be an exciting addition to your collection! Specifications for this 2018-Mo Mexico 1/20 oz Gold Libertad. 05 Coin NGC MS69 FR Exclusive Label SKU54889. Mexican Coat of Arms. Winged Liberty With Volcanoes. We cannot make any price adjustments after the sale is complete. Product Photo Policy: MCM attempts to display product images shown on the site as accurately as possible. We take all of our photos in house and due to reflections on the mirrored or proof surfaces of a coin there may appear to be’black’ when there is not. If a coin has a color on it at all it will be described as’colorized’ in the description or title. Due to the large inventory we sell, we use stock photos. Serial numbers will vary from the image shown unless specifically stated in the product listing that the item pictured is the item you will receive. INTERNATIONAL ORDERS POLICY: We are accepting international orders from select countries. These charges are the customer’s responsibility. However, we cannot guarantee this due to the volume of orders we process each day. Beyond the 30-day return period, Company is under no obligation to accept return of any product, but may in its discretion do so pursuant to this policy, for up to one year from the invoice date. ModernCoinMart (MCM) was launched in 2004 and quickly set the standards for online sales of bullion, US coins and world coins. Join over 100,000 loyal customers and feel confident purchasing from a company that’s spent a decade building a solid and stellar reputation trusted and recognized around the world. That’s the MCM way. View more great items. This listing is currently undergoing maintenance, we apologise for any inconvenience caused. The item “2018-Mo Mexico 1/20 oz Gold Libertad. 05 Coin NGC MS69 FR Exclusive Lbl SKU54889″ is in sale since Thursday, September 20, 2018. This item is in the category “Coins & Paper Money\Coins\ World\North & Central America\Mexico\Mexico (1905-Now)”. The seller is “mcm” and is located in Sarasota, Florida. This item can be shipped worldwide. Total Precious Metal Content: 1/20 oz. 2018-Mo Mexico 1 oz Gold Libertad Coin NGC MS69 FR Exclusive Mexico Lbl SKU54887. The Gold Libertad series was first introduced by La Casa de Moneda de Mexico (Mint of Mexico) in 1981. Coins of the series are favored by collectors for their dramatic imagery celebrating Mexican independence and traditionally low mintages. This beautifully struck 2018-Mo Libertad is struck from 1 Troy oz. 999 fine gold measuring 34.5 mm in diameter. “Winged Victory” is depicted on the reverse, gracefully posed on the famous Mexican Independence Victory Column, grasping symbols of freedom and victory: a broken chain and a wreath of laurel. The background landscape illustrates the volcanoes Popocatepetl and Iztaccihuatl, with 1 ONZA ORO PURO 2018 LEY. 999″ and the mintmark “MO inscribed above. The obverse design features stages of Mexico’s history, represented by eleven Coats of Arms for the nation, with the emblem in current use at the center. Inscribed “ESTADOS UNIDOS MEXICANOS” (United Mexican States). Gorgeous First Releases Mint State 69 with Exclusive Mexico Label. 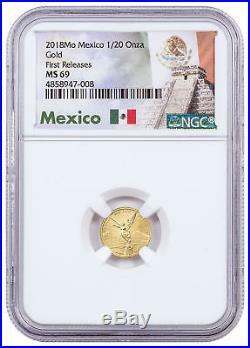 This 2018-Mo Mexico Gold Libertad Coin has been reviewed and graded a virtually flawless Mint State 69 by Numismatic Guaranty Corporation (NGC). For submission to the grading service within the first thirty days of its release date, the incredibly detailed 1 oz. Gold coin also earned the designation First Releases (FR). 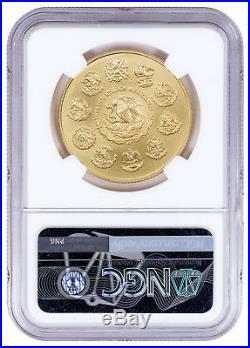 The coin is presented in a NGC protective holder accompanied by ModernCoinMart’s exclusive Mexico styled certification label. This superbly graded 2018-Mo 1 oz. 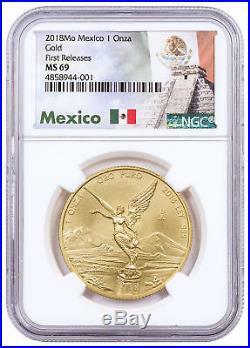 Gold bullion release from the Mexican Mint’s Libertad series belongs in your collection! Specifications for this 2018-Mo Mexico 1 oz Gold Libertad Coin NGC MS69 FR Exclusive Mexico Lbl SKU54887. Mexican Coat of Arms. Winged Liberty With Volcanoes. We cannot make any price adjustments after the sale is complete. Product Photo Policy: MCM attempts to display product images shown on the site as accurately as possible. We take all of our photos in house and due to reflections on the mirrored or proof surfaces of a coin there may appear to be’black’ when there is not. If a coin has a color on it at all it will be described as’colorized’ in the description or title. Due to the large inventory we sell, we use stock photos. Serial numbers will vary from the image shown unless specifically stated in the product listing that the item pictured is the item you will receive. INTERNATIONAL ORDERS POLICY: We are accepting international orders from select countries. These charges are the customer’s responsibility. However, we cannot guarantee this due to the volume of orders we process each day. Beyond the 30-day return period, Company is under no obligation to accept return of any product, but may in its discretion do so pursuant to this policy, for up to one year from the invoice date. ModernCoinMart (MCM) was launched in 2004 and quickly set the standards for online sales of bullion, US coins and world coins. Join over 100,000 loyal customers and feel confident purchasing from a company that’s spent a decade building a solid and stellar reputation trusted and recognized around the world. That’s the MCM way. View more great items. This listing is currently undergoing maintenance, we apologise for any inconvenience caused. The item “2018-Mo Mexico 1 oz Gold Libertad Coin NGC MS69 FR Exclusive Mexico Lbl SKU54887″ is in sale since Thursday, September 20, 2018. This item is in the category “Coins & Paper Money\Coins\ World\North & Central America\Mexico\Mexico (1905-Now)”. The seller is “mcm” and is located in Sarasota, Florida. This item can be shipped worldwide. Total Precious Metal Content: 1 oz.